While gold is valuable, the most common sources of gold you might think of are rarely pure. Whether it's freshly mined gold ore or refined gold used in jewelry, contaminants, unwanted minerals and other metals are usually present. Gold rings, chains and necklaces are often alloys of gold mixed with a percentage of silver, rather than being gold alone. While various procedures can purify gold, using substances like saltpeter or concrete, today nitric acid combined with hydrochloric adid can produce "aqua regia" to make the procedure as easy as possible. To refine gold with nitric acid, you will first need to blend the nitric acid with hydrochloric acid to produce aqua regia. Then, you will need to dissolve, filter and retrieve the gold from the substances bonded to it. Be incredibly careful when handling the various substances involved in the early stages of the refinement process and when melting the gold particles during the retrieval process. Only melt in a secure crucible or metal-melting pan and use safety equipment through the entire process. Only dispose of acids after neutralizing them first. The first step to refining gold involves creating aqua regia – a mix of nitric acid and hydrochloric acid named for its ability to melt gold – and applying it to the gold in question. After choosing a well-ventilated work area and putting on safety goggles, rubber gloves and a rubber splash apron, weigh the gold product or products you intend to refine. This process will require a beaker with 300 mL of capacity for every ounce of weight. With the gold inside the beaker, carefully add 30 mL of nitric acid for every ounce of your measured weight and then 120 mL of hydrochloric acid for every ounce of weight as well. Be careful not to inhale any of the fumes released by the acids. Once the two acids have been applied to the gold, the dissolving process has begun. The mixture of gold and aqua regia will become extremely hot as the gold begins to dissolve. Leave it undisturbed overnight, allowing time for the gold to be fully dissolved. The next day, strain the acid through a Buchner filter funnel to remove particles of undesired material. Repeat the process until the aqua regia is a transparent green. Then, pour the acid into a larger glass container, capable of holding a large amount of liquid. Boil a quart of water, removing it from its heat source before mixing in one pound of urea. Pour the mixture slowly and carefully into the green acid until it stops foaming, at which point you will be ready to prepare your gold. 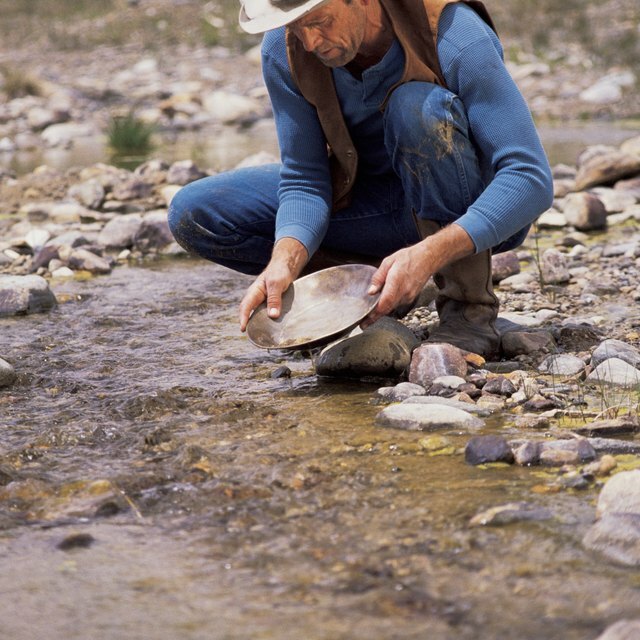 Boil another quart of water, removing it from its heat source before adding one ounce of precious metal precipitant for every ounce of gold product you started with. Slowly adding this solution to the acid will cause it to become a brown color as the dissolved gold binds with the precipitant. Let this sit for at least 30 minutes, at which point you can test to see if the gold is fully dissolved. Dip a stirring rod into the acid solution and dab the end of the rod onto a paper towel. Apply one drop of precious metal detection liquid onto the wet spot on the paper towel. If the liquid turns a dark purple, the solution is not ready and you should wait another half-hour before trying again. If the test liquid turns purple again, add additional metal precipitant solution to the acid, testing every 30 minutes until the detection test fails to turn purple. When this happens, you can retrieve your gold. When the detection test fails to turn purple, it means that the dissolved gold has fully bound itself with the precipitant. Run the acid solution through a Buchner filter funnel to extract the brown particles of gold, setting the remaining acid solution aside to be neutralized with water and baking soda. Place the brown particles into another beaker, before covering with tap water and stirring thoroughly before straining through a filter, disposing of the remaining water and repeating the process several times. Pour a small amount of aqua ammonia over the gold particles to neutralize any remaining acid, before filtering away the ammonia, rinsing the particles with distilled water and straining them one last time. What you have now is refined gold. You simply need to melt and cast it. NCBI: Recovery of gold from computer circuit board scrap using aqua regia. Flournoy, Blake. "How to Refine Gold With Nitric Acid." Sciencing, https://sciencing.com/refine-gold-nitric-acid-10036480.html. 23 May 2018.